VANCOUVER , June 6, 2018 /CNW/ - Marlin Gold Mining Ltd. (MLN.V) ("Marlin" or the "Company") is pleased to announce that it has received encouraging preliminary results from the latest metallurgical testing program being conducted on its wholly owned Commonwealth gold and silver property in Cochise County, Arizona (the "Commonwealth Project"). The results indicate that the gold and silver mineralization is amenable to processing by heap leaching or milling and recovery by industry standard methods. Akiba Leisman , Executive Chairman and Interim CEO states that, "Over the past nine months, Marlin has been conducting extensive metallurgical testing to help define the parameters and process flowsheet for the Commonwealth Project. The entire resource is in oxidized material, and both heap leach and milling scenarios were investigated. The results received to date meet or exceed management's expectations for recoveries and engineering has commenced to determine the optimal capacity and processing method for the project." Samples for the metallurgical test program were selected from 26 large diameter PQ (8.5cm diameter) core holes drilled in 2016 and 2017 along with various exploration assay rejects to represent 28 variations in the style of mineralization identified by the exploration work. McClelland Laboratories Inc. ("MLI") was engaged to conduct a bench scale metallurgical test program to guide the development of the Commonwealth Project. A series of columns tests, and cyanidation tests by bottle roll and agitation were carried out to determine the metallurgical response to heap leaching and a conventional whole ore milling process. The flowsheets for a mill operation considered cyanidation with carbon recovery as well as a flotation concentration and gravity concentration as possible processing options to demonstrate gold and silver recoveries that can be expected from either a heap leach operation or a whole ore milling operation. The test work used a range of size distributions to determine the optimum crushing and grinding sizes for each of the processing options in conjunction with testing the metallurgical response of the 28 variations in the style of mineralization that have been identified by the exploration program to date. The depth of the samples as well as higher grade mineralization was given representation in the variability samples to help guide future mine planning considerations. Composite groupings were defined based on host rock, alteration, mineralization style and either or both gold and silver assays. Fifty-four column tests have been initiated to test the potential to apply heap leaching as the process route for the Commonwealth Project. Although only 11 of the column tests have reached completion and reporting, the preliminary results to date provide good insight into the results to be expected from this type of processing. The average gold recovery after a 75-day leach cycle was 80.4% on all samples crushed to minus 3/8 inch with recoveries ranging from 83% to 88% on finer material depending on the style of mineralization. Results indicate improved extractions with finer crush sizes by as much as 5% to 15%. The main process consumables range from 1.17 to 3.24 kg/tonne of cyanide and 1.0 to 2.5 kg/tonne of lime. The consumption of cement added to agglomerate the finer material was 2.0 kg/tonne. The leach cycle times being tested range from 75 to 100 days with up to 175 days to complete the total leach and rinse times required. The column tests yielded low silver extractions averaging 15.2%. The Company plans to report on the column test results as soon as the full test results report is received from MLI. A series of bench scale tests were carried out to test the metallurgical response to a standard gold mill employing cyanidation with recovery of the gold and silver by carbon in pulp or carbon in leach. This included rolling bottle testing and agitated leach tests with cyanide and pH adjustment with lime. As possible variations to whole ore cyanidation, testing of gravity concentration was carried out as well as flotation concentration to provide preliminary indications of the probable metallurgical response of all variations of the processing options. These variations may possibly reduce grinding costs, reduce consumption of major consumables, and improve overall metal recoveries as well as guide the final selection of the process flowsheet. Bottle roll testing was completed on all composites in a total of 88 tests keeping the cyanide levels and pH constant. The results showed good gold extractions ranging from 85.7% to 97.2% with silver extractions improved over the column testing ranging from 19.0% to 55.1%. Historical mineralogical studies indicated that low silver recovery may be attributed to very fine silver encapsulated in the silica matrix, very fine silver included in jarosite and silver contained within manganese oxides. Ultrafine grinding testing showed improved extractions for both gold and silver but is probably not economic due to the increased power cost as well and probable increased reagent costs associated with the finer material that would have to be handled. Agitated leach tests were carried out on samples which for the most part compared with the bottle roll tests and conclusions reached. The leach kinetics indicated that most of the leachable gold and silver were in solution after 24 hours supporting the normal design parameters of 36 hours retention time in a commercial flowsheet. The cyanide consumption ranged from 0.83 to 1.29 kg/tonne with lime requirements at 1.6 to 2.6 kg/tonne. There was an indication that cyanide consumption was higher on the deeper composites that were tested. Analysis for organic carbon as a potential metal loss from solution showed 0.12% with considerably less in the drill core samples. The exception to the low levels was in two zones with sedimentary material that will require closer analysis in the mining plan and any potential inclusions in the mineralized zones. Scoping level flotation tests were completed on three higher grade composites to test the metallurgical response to single stage rougher flotation. The three composites were ground to 80% passing 100, 150 and 200 mesh (150, 106 and 75 microns). Results indicated that gold recovery to the flotation concentrate would range from 82.8% to 89.1% while silver recovery would range from 10.6 % to 54.9%. As with the bottle roll testing, the finer grind showed improved recoveries of both metals. The tailings from the flotation circuit were subjected to cyanidation tests and indicated the overall recovery of gold would be comparable to the whole ore cyanidation results. This would make the overall process decision on the inclusion of flotation rest on the operating costs of the two options and any potential savings that could be achieved with reagents and grinding costs. The scoping level bench testing of gravity concentration on samples at 80% passing 200 mesh (75 microns) showed 12.2% to 27.7% of the gold and 1.9% to 11.2% of the silver reporting to a gravity concentrate as expected by the metallic assay results. All sample preparation, compositing, and test work was performed or overseen by McClelland Laboratories Inc. in Sparks, Nevada . Their processes and assaying results met the requirements of the Company and its consultants, including Sr. Metallurgist Craig L. McKenzie , and are traceable and well documented. Ross MacFarlane P. Eng Watts , Griffis and McOuat Limited, Associate Metallurgist and Joe Hinzer , P.Geo., the President and Director of Watts, Griffis and McOuat Limited both independent of Marlin and "Qualified Persons" under NI 43-101 have reviewed and approved the written scientific and technical disclosure contained in this presentation. This news release contains "forward-looking statements" within the meaning of applicable securities laws. Forward-looking statements are statements that are not historical facts and are generally, but not always, identified by words such as the following: expects, plans, anticipates, believes, intends, estimates, projects, assumes, potential and similar expressions. Forward-looking statements also include reference to events or conditions that will, would, may, could or should occur, including, without limitation statements relating to: the anticipated access to mineralized material, including any potential mining thereof; the timing and scope of certain drilling programs; the receipt of assay results; statements regarding the perceived merit of properties, exploration programs and budgets; anticipated capital expenditures; mineral resource estimates; timelines; strategic plans; and other statements that are not statements of fact. These forward-looking statements are necessarily based upon a number of estimates and assumptions that are based on management's expectations and considered reasonable at the time they are made, including among others: that work proceeds in accordance with the timing and scope anticipated by management and that anticipated market prices for precious and base metals are achieved. Investors are cautioned that all forward-looking statements are inherently subject to a variety of risks and uncertainties which could cause actual events or results to differ materially from those reflected in the forward-looking statements, including, without limitation: uncertainties related to raising sufficient financing to fund planned work in a timely manner and on acceptable terms; changes in planned work resulting from logistical, technical or other factors; the possibility that results of work will not fulfill projections/expectations and realize the perceived potential of the Company's projects; uncertainties involved in the interpretation of drilling results and other tests and the estimation of gold resources; risk of accidents, equipment breakdowns and labour disputes or other unanticipated difficulties or interruptions; the possibility of environmental issues at the Company's projects; the possibility of cost overruns or unanticipated expenses in work programs; the need to obtain permits and comply with environmental laws and regulations and other government requirements; fluctuations in the price of gold; and other risks and uncertainties, including those described in the Company's annual management's discussion and analysis filed on SEDAR at www.sedar.com. As a result, readers are cautioned not to place undue reliance on these forward-looking statements. The forward-looking statements contained in this news release are made as of the date of this release. Unless required by law, Marlin has no intention to and assumes no obligation to update or revise any forward-looking statements, whether as a result of new information, future events or otherwise. 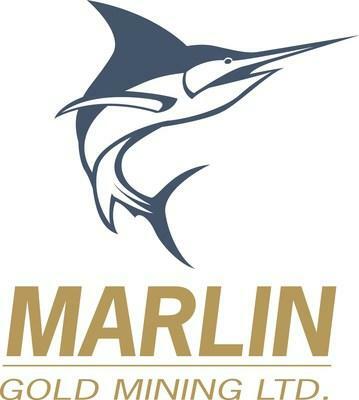 SOURCE Marlin Gold Mining Ltd.